Check out the heavy triple twist horn on this gal and classic genetics going back to Overlyn and Overchill on the top with Watson and Butler breeding on the bottom. 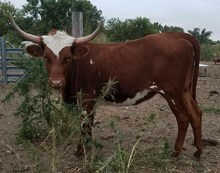 Her big, twisty horn genetics, blended with Jest Command's size, conformation and flashy color, should give us everything we look for at Fiebrich Longhorns. Watch out for this Grande Dame's progeny.